Winning the Western Conference regular season and advancing to the conference finals was enough to get Houston Rockets fans excited again. The Rockets have made the playoffs for the last six consecutive seasons and have advanced to the conference finals twice, cementing their spot on the Houston sports landscape. The average asking price on the secondary market for a 2018-19 Houston Rockets ticket is up 24% over last season. 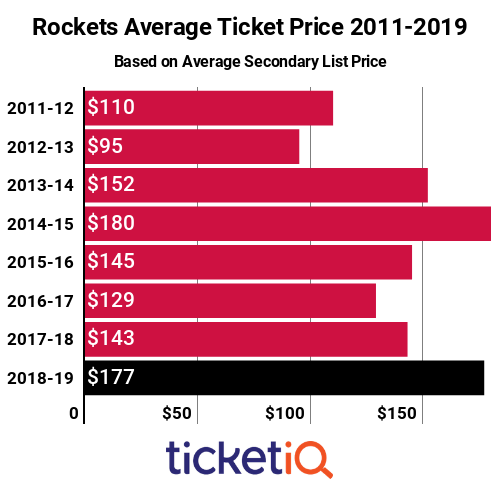 Below is how Rockets ticket prices stack up on the secondary market across the league. Rockets tickets are the second most expensive since 2011, when TicketIQ.com began tracking data. 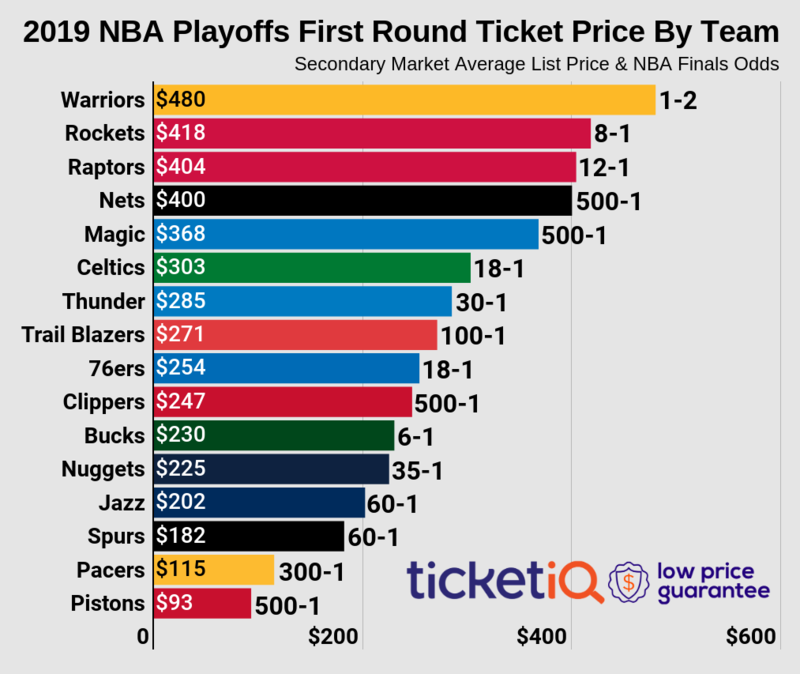 The most expensive ticket was $180 in 2014-15 when the Rockets won the Southwest Division and got to the conference finals before losing to Golden State. At a $177 average asking price, Rockets tickets are ranked No. 15 in terms of price across the NBA, up from a No. 17 ranking last season. and tickets are available to many games, though the biggest games of the season, including those against regional rival Oklahoma City, defending NBA Champion Golden State and the Los Angeles Lakers, are already sold out on the secondary market. TicketIQ.com has secondary market seats available for all games, including the Christmas Day matchup with Oklahoma City. For that game, seats with the company’s Low Price Guarantee are available high above the action behind the basket in Upper Level 419 for $67 and in the lower bowl in Lower Club 119 across from the team benches for $414. 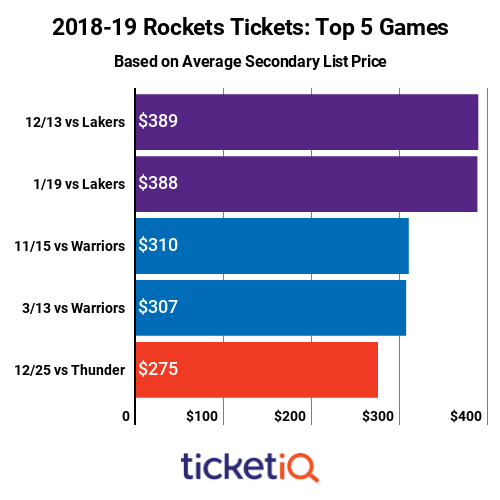 The Christmas Day game checks in as the fifth most expensive of the season in Houston, with an average asking price of $275 on the secondary market. The other four most expensive all involve visitors from out West – the Warriors and the new-look LeBron Lakers. The two most expensive are the Lakers games, with current average asking prices of $389 for the December 13 game and $388 for the January 19 game. While LeBron is a key part of the draw for Houston fans, the Rockets-Lakers rivalry dates back to the 1980s-90s when both teams were consistently in the NBA Finals mix. The Warriors games are commanding $310 for the November 15 date and $307 for the March 13 date. The Warriors have kept the Rockets out of the NBA Finals twice in the last four years and have knocked them out of the playoffs three times in the last four years. TicketIQ.com can help fans get a seat close to the action, with tickets for the first Lakers game starting at $107 in the upper decks and seats for the first Warriors game in the lower sections starting at $300. Assuming the Rockets are competitive, expect prices for all of these games to rise.